It is definitely permissible to do this Fateha of Imam Jafar Sadiq Rahmatulahi Alai in the holy month of Rajab. Even though the Wisaal of Sayyiduna Imam Ja’far Saadiq Radi Allahu Ta'ala Anhu is on the 15th of Rajab, on the 22nd of Rajab Sunnis do a Niyaz (Faateha) attributed to Imam Ja’far Saadiq Radi Allahu Ta'ala Anhu. It must be noted that there is no objection to making this Niyaz or any other Niyaz of the Beloveds. However, our Masha’ikh have mentioned that 22nd of Rajab also marks the Wisaal of Sahabi e Rasool Hazrat Sayyiduna Amir Mu’awiyah Radi Allahu Ta'ala Anhu and some have said that shias show happiness on this day, at his Wisaal. Our Masters have mentioned that when doing the Niyaz of Sayyiduna Imam Ja’far Saadiq Radi Allahu Ta'ala Anhu on this day, we should also include with it the Faateha of Hazrat Sayyiduna Amir Mu’awiyah Radi Allahu Ta'ala Anhu, as some have mentioned that Sayyiduna Imam Ja’far Saadiq Radi Allahu Ta'ala Anhu initially recommended this Faateha to honour Hazrat Amir Mu’awiyah Radi Allahu Ta'ala Anhu. In the month of Rajab, the Koonde of Hazrat Jalaal Bukhari Rahmatullah Allai is done by some people. This is done by cooking rice or Kheer which is filled into earthen troughs (i.e. clay bowls). After that, Faateha is made (over it), and it is fed to the people. This too is permissible. However, there is one thing that is undesirable, and that is the fact that they only feed it to people at the place where the bowls have been filled. They do not allow one to move away from there. This is an absurd practice (i.e. the practice of saying it can only be eaten there) and is the manner of ignorant people. This does not prevail amongst those who are educated. 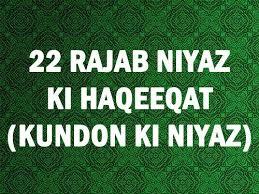 Hence, to do this Niyaz on the 22nd of Rajab or any other day is entirely permissible. The same applies to any other Niyaz. It may be done on any day, as long as the intention is pure and it is done within the confines of the pristine Shariah. It must further be noted that anyone who slanders any Sahabi of Nabi ﻿ is destined for hell. Aala Hazrat Imam Ahle Sunnat Radi Allahu Ta'ala Anhu says that the one who slanders Hazrat Amir Mu’awiyah Radi Allahu Ta'ala Anhu is a dog from among the dogs of Hell. Once, Hazrat Sayyiduna Abdullah ibn Mubaarak Radi Allahu Ta'ala Anhu was asked about whether Hazrat Amir Mu’awiyah Radi Allahu Ta'ala Anhu or Hazrat Umar bin Abdul Aziz Radi Allahu Ta'ala Anhu is greater. Note that the above verse is a very strong evidence of the practice of the Sahaba, which was so loved by Allah that it is part of the Holy Qur’an. Why would the Sahaba pray for the deceased people if their prayer was of no benefit? And to top it all, Allah the Almighty has approved and praised their action! The benefit of the above verse is obvious. The prayer of Prophet Syedna Ibrahim (peace be upon him), includes all believers – right from the beginning i.e. those before him, and till the end of this world i.e. even those who are not yet born. Al Hamdo Lillah! And this prayer is often made in the last part (Qaadah) of our Salaat. This verse says that children will be admitted into Paradise because of the righteousness of the parents. This verse is in fact a command from Allah for all believers to seek mercy for their parents. So what is your opinion? Will not the command of Allah hold any benefit for the deceased parent?? It certainly does. Also note that there are several other verses from the Holy Qur’an that teach us to pray, and the prayer includes all Muslim brothers & sisters (living, passed away or yet to be borne). Readers are requested to reflect on the fact that the above verses are part of the Holy Qur’an – they are read perhaps millions of times every day all over the world, as part of regular recitation, and also as Qirat within Salaat, and also as prayer in the last part (Qaadah) of Salaat.